November 24, 2016, 12:47 p.m.
Back in 2014, the CEO of Levi’s Chip Burgh revealed that you should actually never wash a pair of jeans. The denim boss justified the claim on the basis that the way the indigo wears off through natural use looks much better than if the dye is just washed off uniformly through putting them through the washing machine. Now new YouGov research on Britons’ washing habits can reveal that most jean-owners are washing their denim far too frequently (at least as far as Burgh is concerned). More than one in five men (21%), and just 7% of women, say they wear their jeans ten times or more before they get washed. 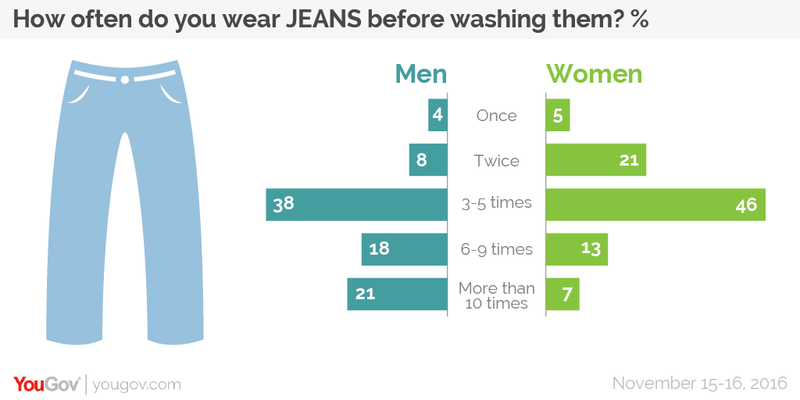 Everyone else is washing their jeans far more frequently, with jeans most commonly being worn three to five times before going through the wash (38% of men and 46% of women). Pants and knickers are the item of clothing people are most likely to wear once before washing. However, and with dispiriting predictability, there is a distinct difference between the habits of men and women. As many as 93% of women say they wear their knickers once before they go in the wash – this figure drops to 74% for men and their pants. In total, 18% of men tend to wear their pants twice or more before putting them through the wash (this figure is three times the 6% for women). When it comes to bras, women should generally wait three or four wears before washing their bras (unless they’ve been really sweaty) according to Lexie Sachs, product analyst in the Textiles Lab at the Good Housekeeping Institute. It’s advice a large number of women are already heeding – 41% of women say they wear their bras three to five times before washing them. Nevertheless, a similar number of women are washing their bras more frequently – 25% of women say they wear their bras twice before washing them, and a further 17% say they wash them after every wear. Women should beware washing so frequently though, warns Sachs, as “over-washing can damage the elasticity, which is essential for providing the proper support”. When it comes to t-shirts, people are actually more likely to wear them at least twice before washing them. 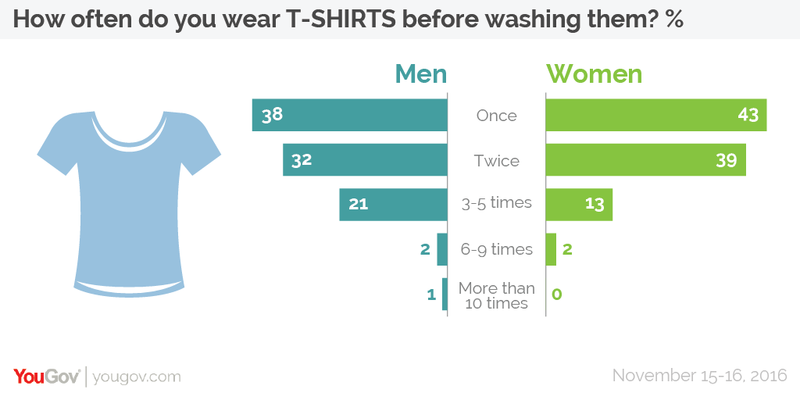 Overall, 41% of people wash their t-shirts after every wash, whilst 55% wear them twice or more. Finally, for those of you looking to don your Christmas jumper for the entirety of the festive period, you’re in luck! 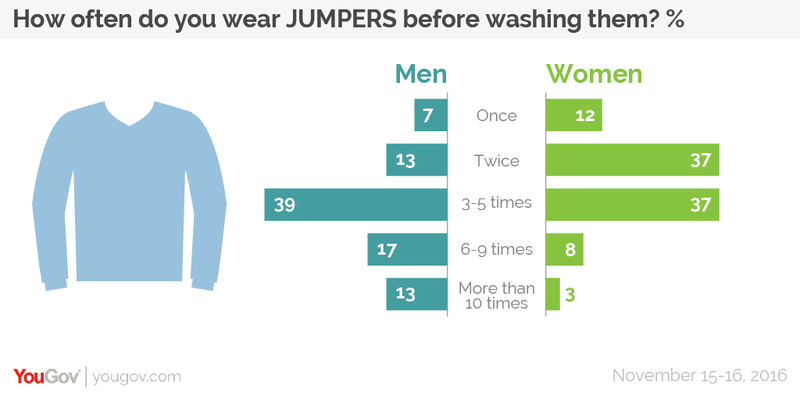 People most commonly wear a jumper 3-5 times before washing them (38%), so you can probably remain dressed for the Christmas spirit without being judged (for the cleanliness of your clothes, at least).